Andrew is available for podcasts, radio and TV work. He also regularly chairs business forums at events. His areas of expertise are: Social Media, Digital Marketing, Personal Branding and Entrepreneurship. Increasing numbers of thought leaders are using podcasts to engage more deeply with their audience and to help build their person brand. In this episode, Chris Ashmore hears from six thought leaders about why they have chosen podcasting to grow their tribe. It was great reconnecting with my old friend Christina Canters, from the C method podcast, to explore how to best use your personal brand to get ahead in your career. Click here to listen on YouTube or on her website. In today's episode, Andrew Ford, corporate escapee, entrepreneur & all round nice-guy shares why he gave up the big pay packet and corner office to pursue his dream of having a business and life operating on his terms. On the Bucket List Life Podcast today is Andrew Ford – the e-ttractionist; a branding expert, published author, keynote speaker, blogger and entrepreneur who is helping people and business owners become more E-ttractive online. Andrew specialises in helping businesses maximise their attractiveness. His unique method combines personal development and digital marketing to help attract more opportunities for his clients and their business. Andrew is the author of the book “Creating a Powerful Brand – It’s Not Just Business, It’s Personal.” and it was a pleasure to chat to him on the Bucket List Life Podcast. – Andrew Ford the E-ttractionist? – What is Social Star? – Andrew’s book – Creating a Powerful Brand – It’s Not Just Business, It’s Personal. – Top 3 ways to become e-ttractive in business? – Top 3 ways to become e-ttractive in the other areas of your life? – What Andrew’s book is all about. Welcome back to another wrap-up episode of The Rebrand Podcast, the podcast where it is all about turning your passion into a business and living your dreams. In this episode, I wanted to revisit a chat I had with two amazing Australians, Andrew Ford (@sirford) and Dan DeWitte (@dandewitte). These two guys are absolutely amazing and both incredibly inspiring. 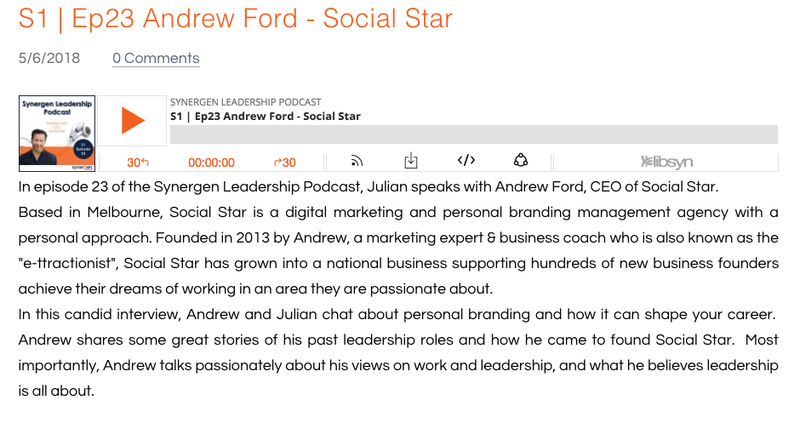 Andrew Ford is the founder of Social Star out of Melbourne, Australia. An unbelievable networker, you may know him from such conferences as “superman” at Social Media Marketing World with another fellow Aussie, Christina Canters. Andrew is a published author and an expert on personal branding. In this segment, I talk to him about a success story and find out what has made him the proudest during his journey.